We are a nation that loves to eat in the street. Leta��s face it, therea��s something so satisfying about standing in front of a beach and chowing down bhel poori, that Mumbaia��s Chowpatty Beach stalls see patrons stopping by on bicycles and Ferraris alike, rubbing shoulders, plate in hand. While cheap, greasy roadside food will never go out of fashion, India is suddenly showing interest in the very American concept of the food truck, that evolved from the chuckwagon of the 1860s. And though the oldest food trucks in the country started a couple of years ago, there are still no laws, rules or guidelines for these moving kitchens, and just a handful of cities seem friendly towards the concept. a�?There are no laws for food trucks yet,a�? says Chennai-based restaurateur Vipin Sachdev, adding that one could easily run into trouble with authorities, as he cites how difficult the legal formalities can be. Just last week, Bangalorea��s newest addition to the bandwagon, The SWAT Truck, had to shut shop as the cops played havoc. So they, along with The Square Ruth, have to keep changing their spots, according to police whims. Food truck owners across the country agree with this, pointing out that ita��s entirely left to the local authorities. For instance, brothers TJ and Jagjit Singh have been operating Parathawallas & Grills as a a�?mobile canteena�? near the Film Nagar Club in Hyderabad for two years now, with a municipality and FSSAI license. Further South, Raiju Ramanadhana��s Kitchen Caravan in Muvattupuzha, a small town near Ernakulam, has also been in operation for two years now. In addition to the FSSAI and municipality, Ramanadhan also has a small scale industry license. But the man with the most number of food trucks in the country, Ajay Koneru of Dosa Place from Hyderabad, says, a�?I just take whatever license the authorities ask me to take.a�? He adds that one needs to get the truck certified by the RTO after it is modified. 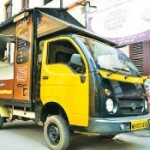 And speaking of modifications, Koneru, the owner of three food trucks that sell a variety of dosas and idlis, points out that there is no equipment designed for trucks, nor any specialists in modifying them yet. One has to make do with regular kitchen equipment and in most cases approach several people to get various aspects of the truck installed. And if youa��re wondering about the capital, it can take anywhere between `4 lakh to `5 lakh to set up a basic food truck, agree Mumbai-based Shreyansh Madiwale and Nikhil Marathe. They sell a variety of quick fixes from milkshakes to momos and even biryani, through Eat N Run, a Tata Ace that is manned by their team of two employees. Siddhanth Sawkar, who started The Spitfire BBQ Truck with partner Pratika Binani a year ago, is currently in the process of re-fabricating his Bangalore-based vehicle. He takes pride in having done all the modifications to his Force Tempo Traveller himself, and is also open to helping others with their food trucks. While Sawkar agrees with his counterparts on the need for legal provisions for food trucks, he disagrees with the premise th at these trucks are about quick food. a�?For us ita��s about fresh food and not fast food,a�? insists Sawkar, whose customers go where his burgers and hot dogs go, thanks to Facebook, the platform through which most food truckers inform their patrons about the whereabouts and specials of the day. But this will soon be replaced by real time tracking, shares Yelamanchili Karthik, who is working on a GPS app that will enable his customers to track The Yum Stop across Hyderabad. Karthik happens to be the only food trucker who operates from 7 am to 2 am (most of the other trucks are open only for lunch and dinner), with staff working on shifts to provide for the huge IT crowd that they cater to. Currently seeing around 300 customers a day since he started last August, Karthika��s mission is to have at least 50 trucks operating in the next six months. While food trucks are meant to reach out to a large audience by operating in new locations regularly, this is something only a handful of food truckers dare to do, since one has to approach the local authorities before setting up in a new place. Thankfully, Karan Malik from South Delhi begs to differ. 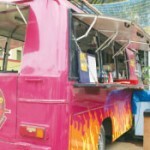 He gives new meaning to the concept of a food truck, having driven his Super Sucker Food Truck from Delhi to Goa, twice. 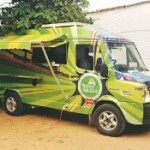 In just 14 months of starting Super Sucker Food Truck, Malik is already a regular in the music festival circuit and was recently seen at VH1 Supersonic Goa 2014. 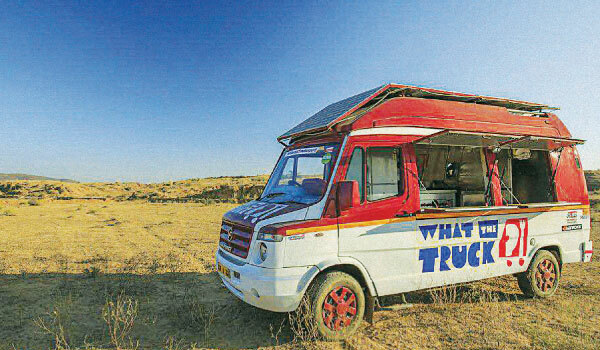 Focusing on taking his brand of wraps, kheema pao and more to events, this food trucker has been to NH7, Sunburn and other festivals on invitation by the organisers. And when hea��s not rocking festivals, hea��s busy signing up at events in and around Delhi. There ar e approximately 20 food trucks operating across the country currently and the numbers are growing. 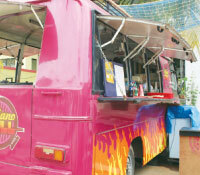 But despite owners like Shakti Subbarao of eight-month-old Gypsy Kitchen in Bangalore looking to start more trucks across the country on a franchisee model, how long will it be before the food truck gets its own laws and governing guidelines? Restaurateur and president of the National Restaurant Association of India, Riyaaz Amlani feels that there is hope, a�?but the government has to be convinced. Like in the case of microbreweries, we will have to wait for an intervention.a�? He adds that once the laws are in place, a�?every restaurateur will jump to own one.a�? And if you cana��t wait that long for more of these to join the circuit in our city, herea��s a quick look at the food trucks creating a buzz across the country.